Skyway West offers three colocation choices in Vancouver with direct connections to Skyway’s network: limited space in the 555 West Hastings Street “Meet Me Room” for those interconnecting with other ISPs, entry-level colocation at 970 Burrard and brand new state-of-the-art facilities at 1050 West Pender (Cologix). All facilities use multi-homed IP addresses that transit through Telus, Bell Canada, Level3, Hurricane Electric and Nippon Telephone and Telegraph, and peer with many providers through VANIX (e.g., BC Net, Shaw) and other exchanges. Multi-homed IP addresses automatically route traffic through whichever provider offers the shortest distance to/from your location. As a result servers hosted on Skyway’s network are closer to your customers across North America, Europe and Asia and experience less latency and jitter than servers outside our network. Colocation in our network core at 555 West Hastings is provided in the building’s Meet Me Room. This building is the center of Internet activity in Western Canada, offering the best connectivity options to the United States, Asia and 50 other BC ISPs through VANIX. Our interconnection space is intended for switches and servers requiring a direct connection to other ISPs, our network and customer base. Space is limited and is sold in 1U increments. Elevators are locked off to the public after hours, sign-in is required with on-site security, and there are cameras throughout the building. Supervised access must be arranged beforehand. We recommend customers use switches, or servers requiring little maintenance and managed remotely. We recommend the use of IPMI devices with secure passwords and IP based Access Control lists. We can arrange an extra Ethernet port and IP Address for IPMI purposes. *Each Unit measures 19″ wide x 24″ deep x 1.75 ” high. Power is sold in one amp increments and is charged at $15 per amp/month. Reliable uninterrupted power is provided by an Automatic Transfer Switch (ATS) connected to two Universal Power Supplies (UPS) on separate circuits, one of which is backed up by Generator power. Choose between paying by the GB or by Mbps. As a general rule, GB billing is less expensive for small volume bursty traffic that is concentrated in an 8 to 10 hour period. Mbps billing is less expensive for higher volume, non-bursty traffic that is constant through a 24 hour period every day. GB Charges The first 250 GB is Free. After that, we charge $1 per additional GB or $50 for 100 GB, $250 for 1,000 GB. All prices are negotiable based on volume and can be purchased with unlimited traffic. Mbps Charges We charge based on committed Mbps. Committed traffic is billed one month in advance. Traffic above the prepaid amount is billed at the end of the month. All prices are negotiable based on volume. Our minimum commitment of 10 Mbps for $150/month, $15.00/additional Mbps. Or, 100 Mbps for $250/month, $2.50/additional Mbps. Colocation at 970 Burrard is for customers who may not need full cage space but require excellent security and the comfort of knowing their Internet servers are accessible to them on demand. Customers have 24/7 access using a card key and iris scan. The elevators are locked off to the public and there are cameras on the elevators, entrance doors, and hallways. Customer supplies and manages their own switch, firewall, servers and server backup. This facility is located in the former BC Hydro building, directly linked to the adjacent hydro substation, and therefore has the highest grid power uptime of all downtown buildings. Mbps Charges Choose between 10 Mbps ($50/mo), 100 Mbps ($150/mo), 250 Mbps ($300/mo) or 1000 Mbps ($500/mo). Prepaid (committed) traffic is billed one month in advance. Traffic above the prepaid amount is billed at the end of the month at an additional $6/Mbps. All prices are negotiable based on volume. 1050 West Pender is for customers who require at least a full cage of space, the highest security, a state-of-the-art work environment and colo space optimized for cooling and energy efficiency. Customers have 24/7 attendant controlled access monitored by camera. Visitors are accounted for by a body scan during entry and exit. The site is extremely green, minimizing your carbon footprint. It is designed for ultra-efficiency, enabling the outside climate to cool the data centre for most of the year. 1055 West Pender is directly connected by a low latency fibre ring to the Skyway network core six blocks away at 555 West Hastings. This building is the center of Internet activity in Western Canada with the best connectivity options to the United States, Asia and 50 other BC ISPs through VANIX. Customers can also buy internet transit (by Mbps) from Skyway in this facility. Space at 1050 West Pender is sold by our partners, Cologix. Contact Skyway sales by email or at 604 482 1225 for an introduction. Skyway charges $100/month for a 100 Mbps Port (GigE and higher are available. Ask for quote). Usage charges are extra. Mbps Charges Internet transit is $15/month per prepaid, or committed, Mbps, with a minimum initial commitment of 10 Mbps. Prepaid (committed) traffic is billed one month in advance. Traffic above the prepaid amount is billed at the end of the month at an additional $20/Mbps. All prices are negotiable based on volume. 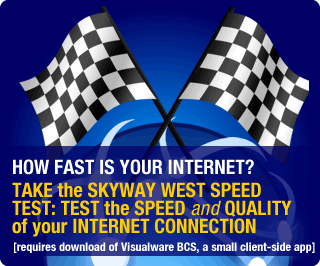 Skyway guarantees all colocation customers 100% uninterrupted transit to the Internet. If transit to the Internet becomes unavailable, Skyway will refund the customer an amount equal to one day of the customer’s pro-rated recurring monthly charges during the month the interruption took place. The SLA does not cover outages caused by equipment and/or events not under the direct control of Skyway or caused by individuals not directly employed by Skyway. This SLA does not cover outages due to scheduled or emergency network and/or facility maintenance, which will be broadcast to all customers in advance.